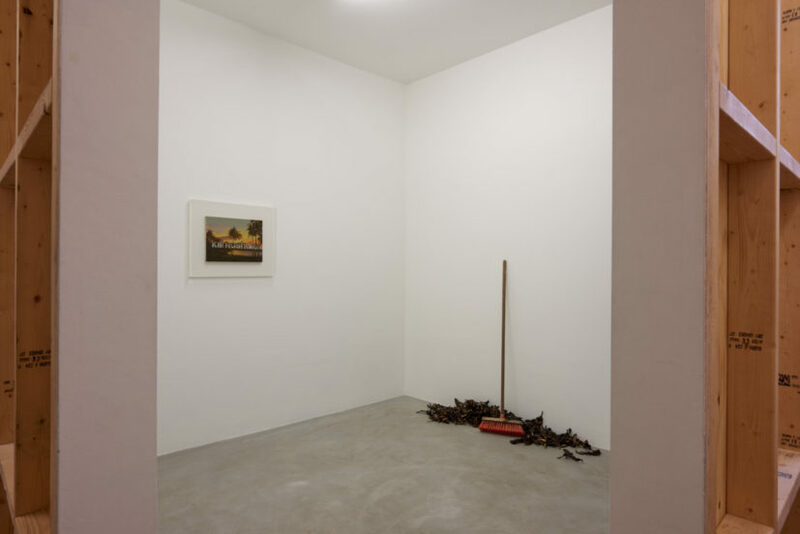 'Amikam Toren, Safe City, 2018 installation view. Courtesy of the artist, Anthony Reynolds Gallery, London; Jessica Silverman Gallery, San Francisco and Matt's Gallery, London. Photograph by Jonathan Bassett. 'Amikam Toren, Safe City, 2017 - ongoing. Courtesy of the artist, Anthony Reynolds Gallery, London; Jessica Silverman Gallery, San Francisco and Matt's Gallery, London. Photograph by Jonathan Bassett. Amikam Toren, Safe City, 2017 - ongoing (detail). Courtesy of the artist, Anthony Reynolds Gallery, London; Jessica Silverman Gallery, San Francisco and Matt's Gallery, London. Photograph by Jonathan Bassett. This is not so much an exhibition review as a starter’s pistol: you have just two days left to see this latest in a series of ten-day exhibitions that Matt’s Gallery has been running all year. Next week Matt’s Gallery will pick up the keys to their permanent new home in Nine Elms, near the American Embassy, and will move in at some point in the next 12 months. Until then they are temporarily based in Bermondsey, in the diminutive ground-floor space of a house that used to be the studio of Alexis Hunter and Roger Shaw, and after that was an office for Café Gallery Projects’ (CGP) founder, the artist Ron Henocq. 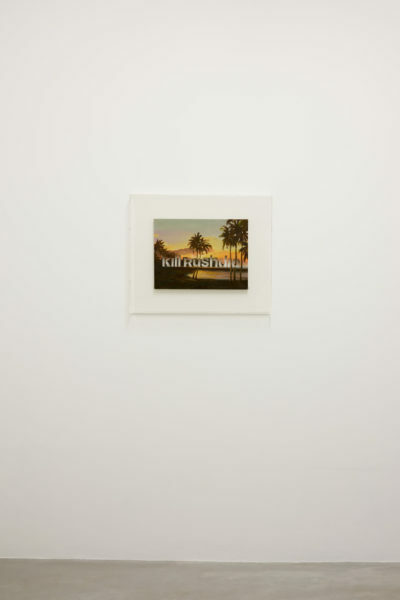 Matt’s director, Robin Klassnik, founded the gallery in his own studio in London Fields in the early 80s, inviting artists to show for just one week at a time. So the current place and programme take him right back to his roots. Amikam Toren was born in Israel in 1945 and lives and works in London. His first solo show here was at the Serpentine in 1976 followed by the ICA in 1979. His first exhibition with Matt’s Gallery was in 1981, a fact which speaks volumes. 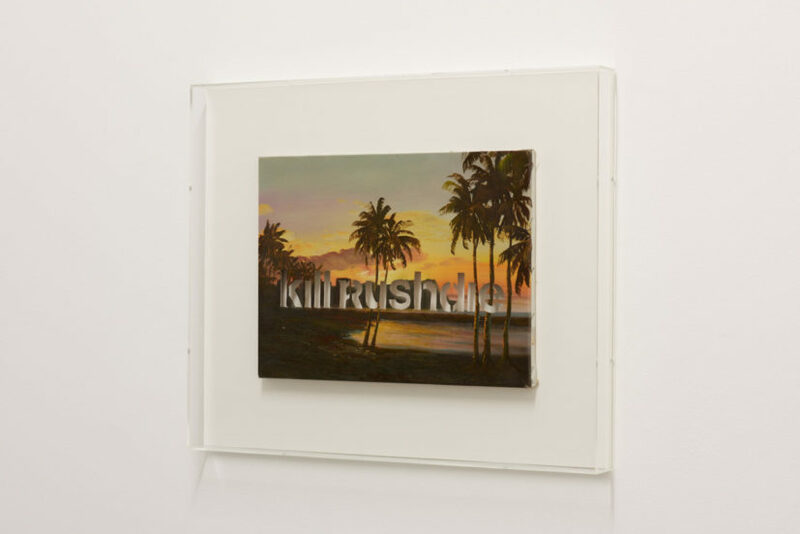 Safe City includes just two works, bracketing 28 years of the artist’s practice: the first work is Untitled (kill rushdie), 1990. This is one of a series of paintings the artist calls ‘Armchair Paintings’. A leading figure in British Conceptual Art, Toren’s practice also operates in sensitive dialogue with other 20th century movements including surrealism, arte povera and minimalism. The Armchair Paintings are created by cutting text into paintings that the artist finds in thrift stores. The texts are also a form of ‘found object’, taken from graffiti that Toren encounters across the city. The works have a profound, textural connection to place and time, all the while operating as sharp conceptual propositions. This particular painting has never been seen in London before; it dates from the year after the fatwā was pronounced on Salman Rushdie in response to the publication of his novel The Satanic Verses. 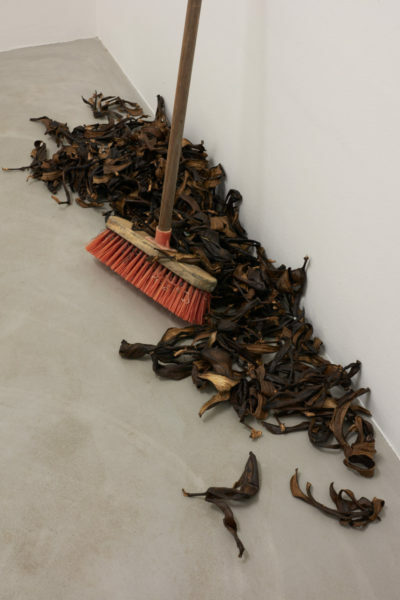 The second piece in the show, Safe City, is composed of a pile of dried banana skins swept into a heap with a broom. 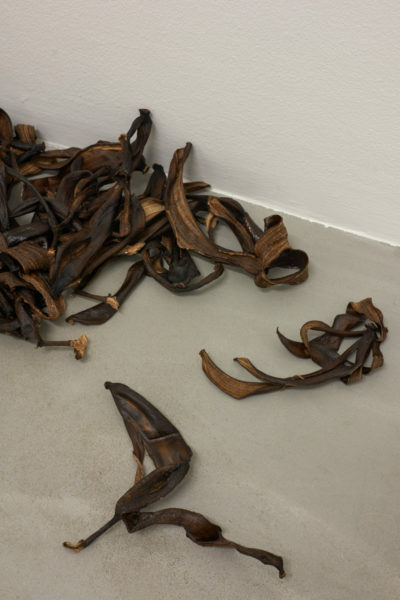 It is dated ‘2017 and ongoing’ to describe the process whereby the artist has collected banana skins he finds on his walks across the city. It encapsulates both the gesture of the person discarding their rubbish and the act of the artist, who won’t let us slip. The curling, dried and blackened skins have a calligraphic quality individually, and collectively have a pleasing sculptural presence, swept up against the wall. The artist has referred to his work as “tactile thinking” and the primal pleasure derived from simple, repeated actions goes to the heart of the notion of making, as well as supporting this poetic practice. 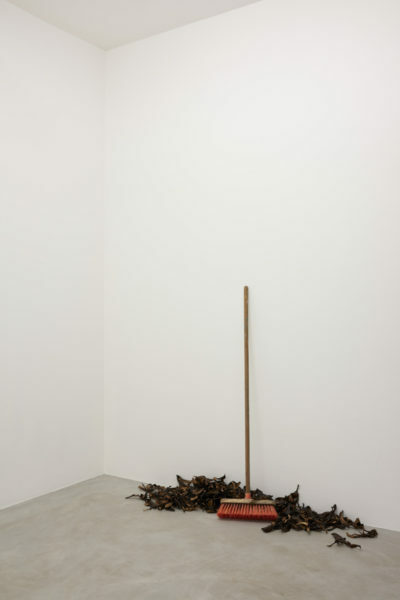 Like his earlier work, Black Hole, 1997-2006, that is composed of a refuse sack filled with the spiralling dried peels of his daily orange, the sculpture is located in the record of a modest act, performed ritualistically. As such it traces its art historical lineage directly back to that 1960s moment which saw Conceptual Art’s rejection of the marketised, high-value object in favour of a practice that embraces abject materials and the ephemeral. In Toren’s work, painting as a medium ceases to be precious and becomes just another category of object to be used. Safe City is deceptively modest, yet deeply considered. It is the work of a person who habitually walks along the street, not glued to his phone, but acutely present in the place and the moment. Toren is the person observing, noting and considering; the graffitis in his Armchair Paintings pick up the mood of the city; his sculptures recuperate the unconscious acts that betray our attitudes. Through acts of addition and subtraction, with destruction and reconstruction, Toren leads us to properly look at what is actually there in front of us. In the Armchair Paintings, illusionistic painting is deconstructed by cutting through the canvas to reveal the wall behind. 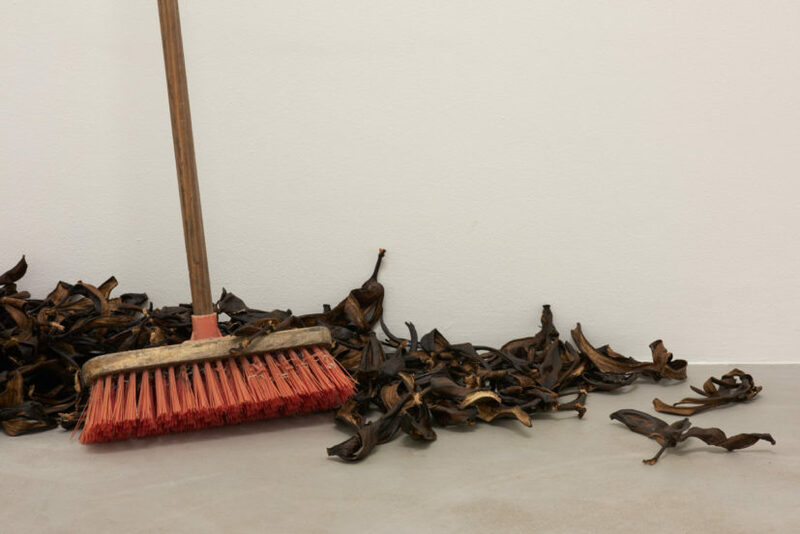 In his sculpture, as well as in his paintings, the integrity of objects is broken down, the whole (bananas, oranges) evoked by their remaining fragments, thereby questioning the status of the original category. As concise and dense with ideas as a Japanese haiku, this show is the perfect way to get to the heart of Amikam Toren’s work. But you need to hurry.